In a bowl, combine peaches, red onion, jalapeno pepper, tomatoes and cilantro. Stir to combine; add lime juice, cumin, salt and pepper. Stir well and refrigerate until ready to use. The jalapeño pepper is optional. You can remove its seeds to tone down the spiciness. Serving tacos this summer? Why not kick up your old salsa recipe with the flavors of summer. Peaches are at their peak, bursting with juicy goodness and pair perfectly with jalapeños. 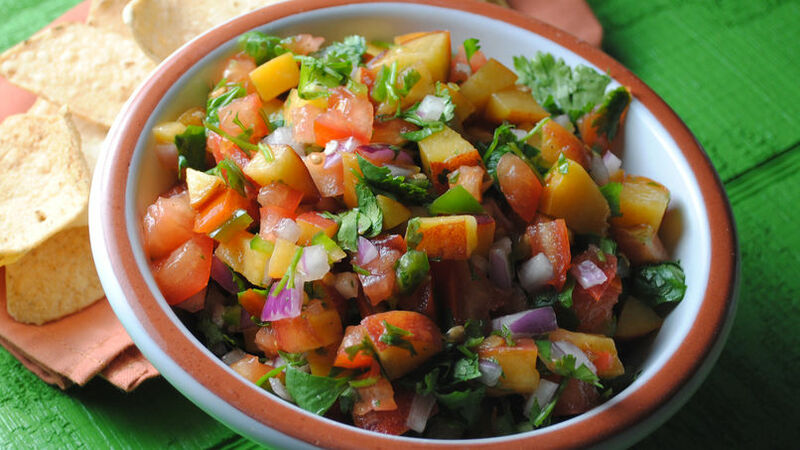 Diced peaches are tossed with red onion, tomatoes, jalapeño and cilantro to make a unique salsa. A drizzle of fresh lime juice and a hint of cumin give this salsa a touch of tang. Serve this salsa with tacos, fish or a platter of freshly made tortilla chips.